Motor Jr is on the left in the blue and white gear, her best friend G is in the red gear. Today was adventure day in Scooterpie World. Motorcycle Man took Moto Jr and her best friend out to try a day in the dirt. Westshore Motocross had a women's day and it was a great way to introduce Moto Jr another avenue of riding. I have heard it from many that riding in the dirt is a great way to learn to ride and how to handle a bike. I was working today, but managed to sneak out and watch. Traffic was a bear and I thought I was going to miss the whole event. I have been so excited for her and we have both been looking forward to today. This was a great experience and it only cost me $30 for 2 hours of riding, a lesson, full gear rental and a bike to ride. It looked really fun, I think next week I might just give the dirt a whirl myself. Both girls loved it! My daughter loves the puddles and definitely was not shy going through it. Just what I hoped, she went at it with gusto!!! Yup I definitely see another moto diva in the family! G concentrating on an upcoming curve. Moto Jr coming over the hill and dare I say she caught a little air! Look at that grin under the helmet!!!!! Puddle Queen, every time she went around the track she forged her way through the giant puddle. Yup there was half the puddle inside the boots. For kicks after we got home we went to a local dealer just to have a peek at gear. I think we will be going back in the near future. Saturday was moto adventure day! It started out cold and cloudy, but we ventured out despite the threat of rain. 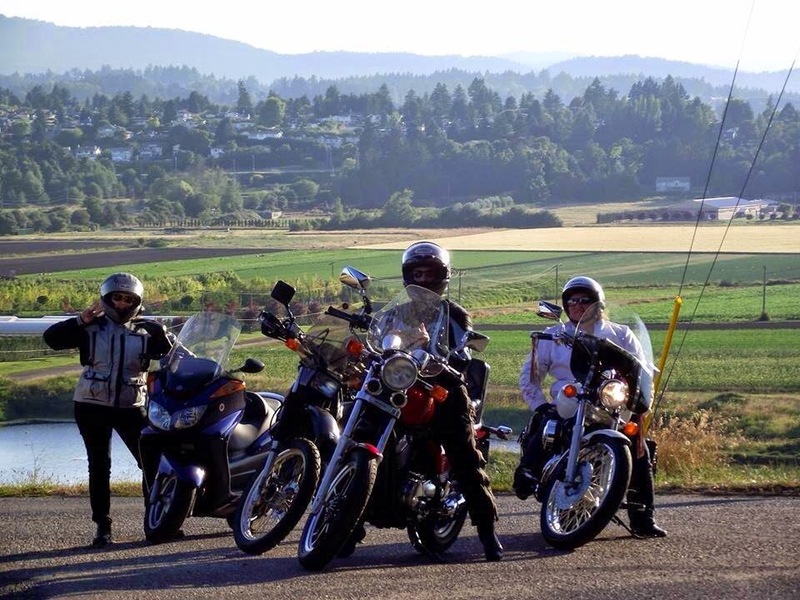 We met up and rode over the Trans Canada#1 Malahat highway. We made our first stop at West Coast Roar the best female riding gear store on Vancouver Island (they also carry men's gear). We chatted with Greer and Joley the owners of Roar. We drooled over all the lovely jackets and riding apparel. We had coffee and nibblies at Serious Coffee next door and then we were off. Our second stop was in Duncan to pick up my new Shoei (I am still stoked about this). After that it was approaching lunchtime and we decided to drive to Crofton and have lunch at Lito's Cafe & Galleria. Kristen and Liz had yummy looking cuban sandwiches and I decided to skip the sandwich and go straight to dessert. It was homemade to die for carrot cake. All three of us had a piece. It seems we are becoming a RTE (ride to eat) group. The Vancouver Scootering Club RTE crew needs to come visit this little cafe for the carrot cake. After our delicious lunch we decided to wander down the highway to Chemainus. Chemainus is a picturesque little town that is part of the Stz'uminus First Nation, located in the Cowichan Valley. Chemainus was named after a powerful First Nation's Chief Tsa-meeun-is which translates to Broken Chest. 1858 brought logging to the community and the mills were thriving until the early 1980's and at the point the mill was closed. The town was dying, but was revived as a tourist destination. Chemainus is famous for the 39 murals painted on the buildings around the town. The murals tell the story of the town. Chemainus is home to a thriving tourist industry with antique shops, eateries, galleries, and theatre. It is a lovely walk around the town and great fun peeking into the eclectic little shops. In 2006 a Boeing 737 was sunk off the coast to create an artificial reef, which is home to aquatic plant and marine life. snap her picture, she is dressed in early 1900 clothing. After wandering around Chemainus and stopping for some refreshments it was time to hit the road and head home. We detoured and drove through Cowichan Bay, my old home town for 9 months, that is where we bought our floathome the Resting Cloud and lived aboard for 9 months before towing it to Westbay in Victoria. of Liz's bike - carrot cake. The inaugural run of the new Shoei RF1100 Sylvan helmet. The graphics remind me of a mardi gras mask. Helmet Nirvana! *writer acknowledges wikipedia for facts regarding Chemainus and the Cowichan Valley. When I started scootering I fell in love with gear that was pink, most of it was because I thought it looked feminine and I didn't have any desire to have a helmet with skulls all over it. Don't get me wrong I think a good skull and crossbones has its place, just not on my helmet. The luster of pink quickly wore off and decided that I wanted an upgrade. When I purchased my current HJC helmet I was having a hard time finding one that fit and ended up with a youth extra large - it fit well & was comfortable. In the beginning I was spending lots of money trying to get outfitted for riding and a Shoei was on my dream list, but was out of my budget. I bought entry level gear and was disappointed with the results; jackets, pants, boots leaking and the helmet noise beyond acceptable. I have learned a valuable lesson when purchasing gear, spend a little more and get what you want because the next level up of gear will more than pay for itself. I have had my eyes on a Shoei Goddess Quest in white. I have oogled and ogled, drooled and wished for this helmet, tried it on several times and it was PERFECT! I decided a few months back to start saving for it, because my old HJC was getting pretty beat up, the chin strap was starting to fray, the liner was grimy because I happened to be a girly girl and wear make-up. I was just getting ready to go plunk down my hard earned dollars and buy the coveted helmet of my dreams, when a friend told me about a helmet he had bought for his kid, but made the huge mistake of not taking said child to try it on before purchasing. With most motorcycle dealers helmets are non-refundable and he was stuck with a $500+ helmet. It still had the transparent protective vinyl on the visor - never been worn. It was like a case of Cinderella and the ugly step sisters trying to cram their feet into the glass slipper. I tried it on and IT FIT!!! It isn't the Goddess Qwest, but an RF1100 Sylvan. I love the graphics and the helmet is full of sparkles which sings to the inner diva in me and the pattern reminds me of gossamer dragon fly wings and there is a diamond jewel pattern on the top. It kind of reminds me of an elaborate Mardi Gras mask. Oh my! Here is the best part, when I asked him how much he wanted he said $100. I said "REALLY?!" He said "Yup" I handed him the money, squealed with delight and off I went. I could not believe it!!!! I have checked the helmet out on-line and a few local retailers, it is going from about $500 to $680. Ka-ching! WOW!!! I love it when the Moto Fairy Godmother sprinkles pixie dust. The best part is the money I would have spent on the Goddess I used to buy Motorcycle Man a present, I bought him an Olympia MOAB jacket and he was thrilled. Now for my technical part of the discussion. The helmet came with a chin curtain, removable washable liners, has plenty of venting and a fabulous anti-scratch coat on the visor. The best part is it is extremely quiet when you are doing 90 clicks down the highway. My old helmet was very noisy and starting to affect my hearing, it was almost as if you were in a hurricane that is how loud it was. I am still breaking in the cheek pads, from what I have read they will compress after a week or so of wear. I went for a long afternoon ride after I got it and there were no tender spots on my forehead or head anywhere. I am one very happy Princess Scooterpie - my new lid makes me feel more like a Queen. Oh! 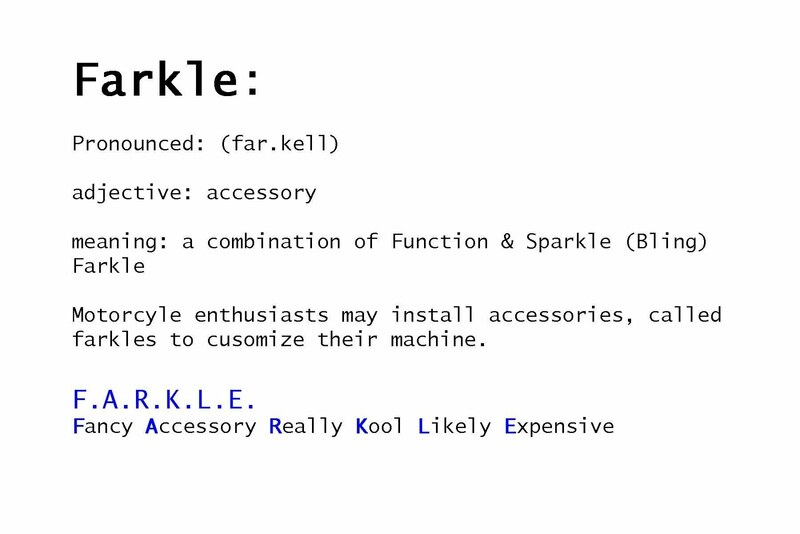 Look at the sparklies!!!! 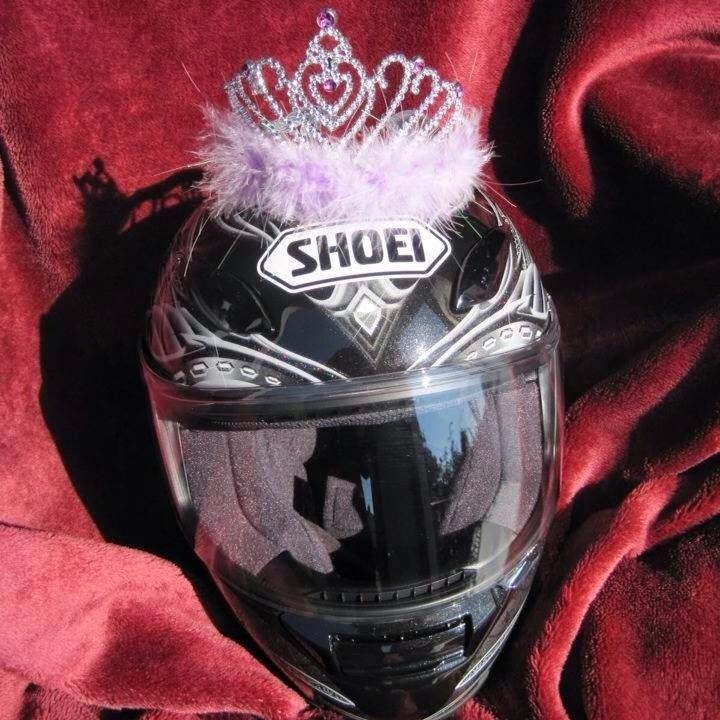 A helmet fit for a Moto Diva! Since I started my scooter/motorcycle journey I have been bitten hard by the riding bug. 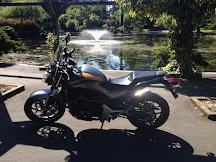 I am approaching the two year mark between the scooter and motorcycle. I ride a lot, every day in fact, through all sorts of weather rain, fog, winter, spring, summer, I commute and do a lot of 'tootling'. Motorcycle Man was inspecting my bike and decided I was due for a new rear tire. We shopped around and ordered a Metzeler Lasertec tire. 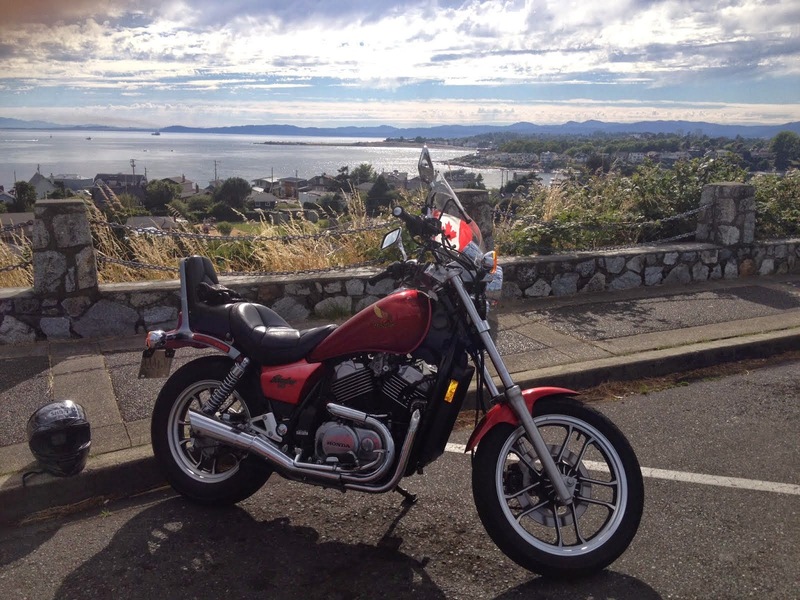 Motorcycle Man has had Metzeler tires on his bike for a few years and really likes them. He is sold on them for riding in the rain because they move the water really well and are fairly sticky for a street tire. I ordered the new one online because no one had it in stock and they were on back order until November, I guess it is pretty popular tire. 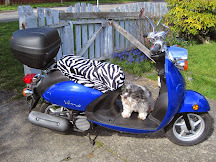 When it arrived I went out to Kenco Motorcycle in Sooke and they installed it in a jiffy and the service was GREAT and very reasonably priced. I am a happy Moto Mama now and today I went riding with two of my girlfriends. We logged about 200km, I have to wear off the coating on the new tire ;) The tire is fabulous, it makes a huge difference to the ride and steering seems better. So I am pretty happy. Motorcycle Man out in the Moto Lair taking off the old shoe. New shoe being put on. Voila! lets hit the road baby! Blog challenge! It's an easy one! Post a picture of your favorite non-motorcycle/scooter shoes & one of your motorcycle/scooter boots/shoes. Link back to me, just a mini challenge. Victoria is beautiful, particularly in the summer months. The island comes alive and everyone is outdoors. Like Martha Living Among Tourists, I also live in a tourist destination which is particularly busy in the summer months. Here are some photos I took while out on an evening power walk with my hubby. My walk starts out at West Bay by the floathome community - I was lucky enough to live on a house moored here for 10 years. I really miss sitting out on the deck and watching the world from my little paradise. I am blessed however to still live here and go strolling on this walkway, it goes from Esquimalt to downtown Victoria and you can connect up with it on the other side of the harbour. Enjoy my evening walk with my hubby. Victoria has a very busy working harbour. This is looking over towards the Ogden Point Cruise ship dock. A local Artist created this along the shoreline. It is pretty cool. We are the City of Gardens and it is beautiful here in summer. Looking back towards West Bay on the walk home.